“I highly recommend The Shellies to all Local Mums. The Shellies' bright and colourful books are a delight for children of all ages, well written and illustrated and with an interesting storyline, and different characters to appeal to all children - we felt like we were at the beach with them!" “I highly recommend�The Shellies�to Local Mums.�Adventures on the beach, absolute fun. The Shellies went off in search of their friends. The children adored bossy boots Crabby!" In a cave on the beach live�The Shellies�. Join Crabby, Rainbow and their friends in their exciting video and e book adventures! Ahoy! 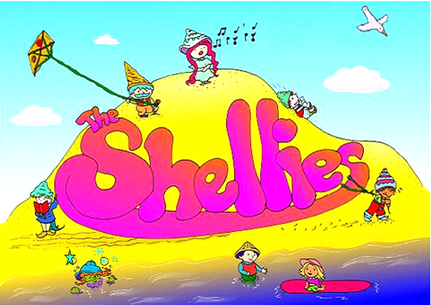 We are�The Shellies�.�Join us in our exciting adventures at the seaside by downloading our video books or e books.�Join Crabby Rainbow and their friends in stories which will make you smile.�Marvel at their inventions and have a truly Happy Bay!